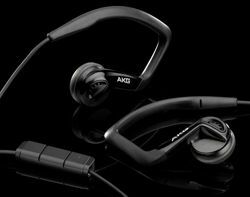 AKG's new sports headphones hook you in to your tunes | What Hi-Fi? Billed as sports headphones, they use an adjustable ear hook design in an effort to better stay in place to deliver your tunes. A closed-back design, they weigh just 5g, are available in red or black and come with an in-line mic that's compatible with iPad, iPod and iPhone. The AKG K 326 headphones have a suggested retail price of £60 and are out now.